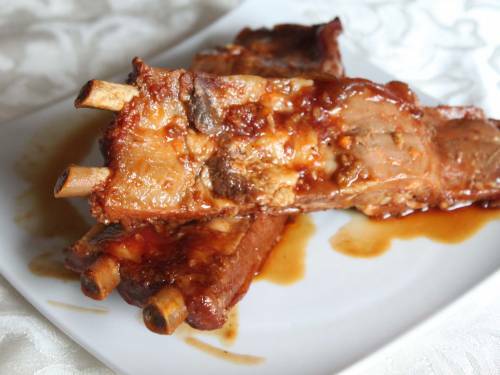 In large pot of water, boil ribs until tender. In separate saucepan, add soy sauce, 3 cups of water, ketchup, brown sugar. Bring to boil, turn down and add cornstarch to thicken. In a roaster pan, place drained ribs (slabs) and sauce, then add peppers, onions, spices. Bake covered 20-30 minutes, or until tender. Remove lid towards end of baking. Continually check so ribs don't burn or sauce dries up. Husband loved them! I only used one green bell pepper and one onion; using 10 peppers seemed like way more than we needed. I also didn't use any water or cornstarch. I didn't have any problem with them drying up or burning in the oven.